The beginning of the 1990's saw a partisan debate about the nature of recovered memories for highly emotional events. Some authors claimed that recovered memories of trauma always referred to veridical memories that had been inaccessible for years. Others argued that such memories were false by definition and that they were created by therapeutic attempts to uncover trauma that was believed to lie at the root of anxiety or depression. Although the debate soon moved to a middle ground, both sides fuelled the development of relevant experimental paradigms to explore the mechanisms for how false memories might be created and also how true memories might be forgotten. Examples are studies looking at memory implanting, false word memory, and retrieval-induced forgetting in the mid-1990's. Many studies using such paradigms, however, relied on emotionally neutral material. Studies relating to trauma were less readily available. Now more and more researchers are bridging this gap, testing whether emotive material can be implanted and forgotten and whether there are special populations more susceptible to these effects. This special issue brings together papers examining emotion and memory malleability, both providing a picture of the state-of-the-art research and pushing the field forward. 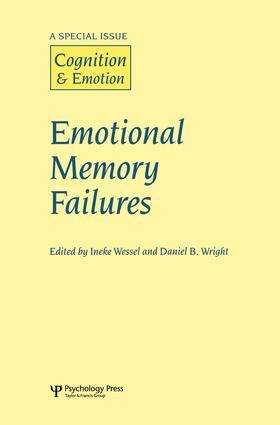 I. Wessel, D. B. Wright, Emotional Memory Failures: On Forgetting and Reconstructing Emotional Experiences. A.J. Barnier, L. Hung, M. Conway, Retrieval-induced Forgetting of Emotional and Unemotional Autobiographical Memories. R.J. McNally, S.A. Clancy, H.M. Barrett, H.A. Parker, Inhibiting Retrieval of Trauma Cues in Adults Reporting Histories of Childhood Sexual Abuse. L.B. Myers, N. Derakshan, To Forget or Not to Forget: What Do Repressors Forget and When Do They Forget? A.J. Barnier, K. Levin, A. Maher, Suppressing Thoughts of Past Events: Are Repressive Copers Good Suppressors? M.S. Shane, J.B. Peterson, Self-induced Distortions and the Allocation of Processing Resources at Encoding and Retrieval. L.J. Levine, S. Bluck, Painting with Broad Strokes: Happiness and the Malleability of Event Memory. V. Nourkova, D.M. Bernstein, E.F. Loftus, Altering Traumatic Memory.